Studio Lighting | Alien Bees B1600 Survive Dip? Video screenshot – See below for the actual video! 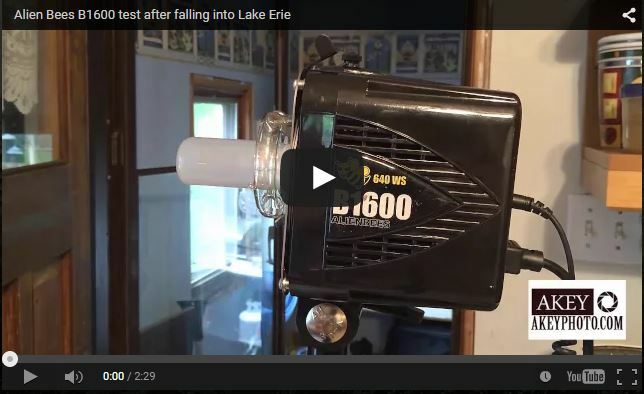 A week ago, I was shooting with one of my models on a beach along Lake Erie (to be released in a future blog post) when my stand with Alien Bees B1600, Vagabond Lithium battery and a Yongnuo remote receiver fell into the lake while power was turned on. With shock and horror still on my face, I said aloud, “That can’t be good..” So, I grabbed the light stand leg, dragged it out of the water and immediately proceeded to switch everything off. Once powered down, I set everything to the side and finished our beach shoot with available light. All in all the shoot went well and produced some of my favorite swimsuit images to date. After the shoot, we (model and photographer) drove back home, parted ways and I went home to deal with my wet equipment. I immediately placed the lithium battery in a box of rice and proceeded to dismantle the B1600, clean the sand and rocks out and then spray with compressed air before setting the unit in a room with low humidity to dry out for 2 days. Once 2 days passed, I reassembled the strobe and set up to record the following video. Can an Alien Bees B1600 survive a fall into a lake? Watch and see for yourself! Disclaimer: Disassembling an Alien Bees unit will void your warranty. Also, the unit contains a high voltage multiplier circuit and may result in electrical shock. This is an educational video. I assume no responsibility for your use or misuse of the information presented. This entry was posted in Equipment, Hints and Tips & Tutorials, Video.